The highly regarded Viking 53 Convertible delivers a proven mix of style, luxury and performance. Lavish (3) SR interior with mid-ships Master, Salon, Galley and Dinette area, standard washer/dryer and upgraded furnishings. Highlights include a spacious fishing cockpit, huge flybridge and well designed engine room, Fresh MAN 820 HP power cruises 26/27 knots and 30 knots at WOT. Island Hopper has had thousands spent on her since 1/1/17. See complete list in listing. Seller is no longer using and is motivated. Present offers! United Yacht Sales New Jersey would love to guide you through a personal showing of this 53' Viking 53 Converible 1991. 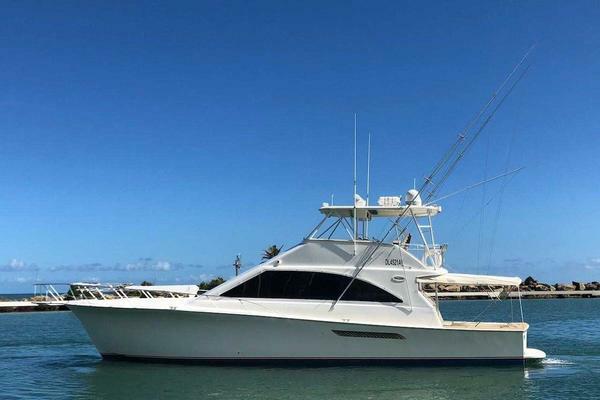 This yacht for sale is located in Pompano Beach, Florida and priced at $199,900. For a showing please contact us by filling out the form on this page and we will get back to you shortly! ex F-Troop is a standard53’Vikingintermsoflayout,designedwith3stateroomsandtwoheads.However,allelseaboutthe yachtisanythingbuttypical!Pleaserefertothewalkthroughforamoredetailedexplanation.Thegalleyisupontheport sidewithadinettetostarboardandthesalonislargeandcomfortable.Thecockpithasplentyofroomfortheserious fishermanwithfulltacklecenter,transomdoor,in­deckfishboxandentrancetotheengineroom.Theflybridgeis comfortablewithtwinhelmchairs,abenchseattoportandanL­shapedseatinfrontofthehelm.Thebowprovidesa pulpit&windlasssystemaswellasadavit for a tender. ex F-Troop canbeboardedfromeithersideofthecockpitorfromtheswimplatformthroughthetransomdoor.Thecockpit hasafullsizefightingchairandallthenecessaryfishingequipment.Enteringthesalononthestarboardside,thesuperb conditionoftheyachtisobvious.Theteakwoodworkhasaglossfinishandtheinterioristastefullydecoratedwithnew wallcoverings,newcarpet,newcountertopsandAmticoteak&hollyfloorinthegalley.ThereisanL­shapedsofaonthe portsidewithacocktailtable,L­shapeddinettetostarboardwithaPlexiglasdiningtable.Thefullgalleyistoport. Goingbelow,the3rdstateroomwithover&underbunksisontheportsideandacrossthehallonthestarboardsideisthe masterstateroomwith en-suite head&shower.Acabinetinthehallwayhousesawasher/dryer.Fullforwardisacustom largesingleberthwithaccesstothe2ndhead&shower. ex F-Troop isaverycleanandwellmaintained53’Vikingfeaturinglowhours on rebuilt motors. Equippedwitheverythingneededtofishandcruise,this Convertibleisamusttoseewhenconsideringasportfisherman.